I go nuts over the Lord of the Rings franchise, so when I was given the opportunity to travel to New Zealand a.k.a. ‘Middle-Earth’ for a press trip last year, you can imagine how ecstatic I was! …But then again, as a Philippine citizen, I found out that I needed to go first through yet another rigorous application to get myself a New Zealand visa for tourism. I’m not exactly thrilled about my third world passport because of this since there’s always that chance that my request for a visa will get denied. Anyhow, the good news is — I’ve found out that applying for a tourist visa via the New Zealand Embassy is rather easy and also FREE! So with that, I hope my guide below can help streamline the process for your ease so that you can also get that coveted tourist visa ASAP. NO ONE can give you a guarantee on your New Zealand visa’s approval — not even a lawyer, a consultant, a travel agent, or an embassy employee. Anyone who says otherwise is most likely going to be a scammer. That being said, what I can offer you here is a comprehensive guide with helpful tips to increase your chances of getting that New Zealand Visa. » What is a Tourist or Visitor Visa for New Zealand? » How long can I visit? This is another thing that I love about the New Zealand tourist visa: you can visit for a maximum stay of 9 months in an 18-month period! In special cases, you can even extend your stay for a further 3 months (total of 12 months in a 24-month period), if: you need more time to complete your tourist itinerary, you can’t leave New Zealand for reasons beyond your control, or you’ve applied for residence for the first time. To be eligible for this extension, you MUST have financially supported yourself, you have NOT worked, NOT studied, and NOT been sponsored during your stay. » I’ve already visited New Zealand. I want to visit again! Is there anything I should be aware of? If you have recently visited New Zealand and you wish to visit again, you should be aware that the instructions allow a visitor to stay a total of NO more than 9 months in an 18-month period. This 18-month period is calculated backwards from the last day you intend to be in New Zealand. For example, if you want to stay until 1 December 2017, you should count back 18 months, which would have been 1 June 2016. However, if you have spent a total of 12 months in New Zealand as a visitor (wherein you extended to 3 more months after you reached the 9-month limit), you will have to remain outside New Zealand for 12 months before applying for another visitor visa again. There are, of course, various types of New Zealand Visas out there that you can apply for: a visa for studying, a visa for working, a visa for family reunification, etc. For this particular guide, I will only be discussing the requirements for a visit or tourist visa since it’s an experience that I’ve gone through myself. If, however, you have a complicated situation or a different purpose of visit, it’s best that you head over to this page of the New Zealand Immigration for more information. VFS Global is the external service provider that receives New Zealand visa applications on the Embassy’s behalf. Currently, there are 3 ways available for processing your application: (#1) by walking in to VFS in-person or via a representative, (#2) sending it via courier, or (#3) doing it online. Naturally, doing it online is the best option! But it helps to note though that you (or your representative) would still need to go to VFS to submit your passport after you accomplish and upload your documents online. Speaking of ‘uploading‘… to do such, you would also need a bit of computer ‘know-how’ on things like scanning and converting files to .PDF (but then again, these can be done cheaply at a computer or internet cafe shop; and I will even put some tips and links later on in this post for your ease). That being said, doing option #1 and #2 sounds easier, right? Well… personally, I would still recommend option #3. This is mainly because accomplishing the visa application form by hand (found here) is a bit tedious — it’s really long, with parts that are often not applicable to your situation and that could easily confuse you. On the other hand, filling out this visa application form online is a LOT easier because the site automatically skips parts that are not needed (as dependent on your answers). Moreover, if you’re lazy to go to VFS to send in your passport, you can have a representative or a courier to send it for you! If you still rather want to go for option #1 or #2, you can go to this page to know how to. IMPORTANT: If you’re traveling with family, it is now possible to apply for visitor visas together on one application online. Now, since I applied for my New Zealand visa online, I will then be relaying to you my experience — which was so easy. Click the (+) symbol below to expand the section and see the detailed instructions. How to process your New Zealand Visa Online? First, go to Immigration NZ. On the upper right corner, after you click ‘Login‘ a dropdown section will show. It will then show a ‘RealMe’ section with a button that says ‘LOGIN or CREATE ACCOUNT‘. Click this and it will lead you to the RealMe page. Click ‘Create Your RealMe Login‘. The next page will ask for some of your basic information. Once done, click the button at the bottom that says ‘Create My RealMe Login‘. Click ‘Continue‘ on the next page and log-in with the username and password that you created during sign-up. This will lead you to another page where you can create your profile. Just enter your full name under ‘Display name‘ as well as your email address in the email field box. Click ‘Agree and continue’. The site will now tell you that it has sent a verification email to your email address. You must click on the link that they sent you so that you can proceed to use the site. Hence, log-in to your email account, look for their email and click on the verification link they sent you. Finally, you’re now at New Zealand’s Immigration Online portal. 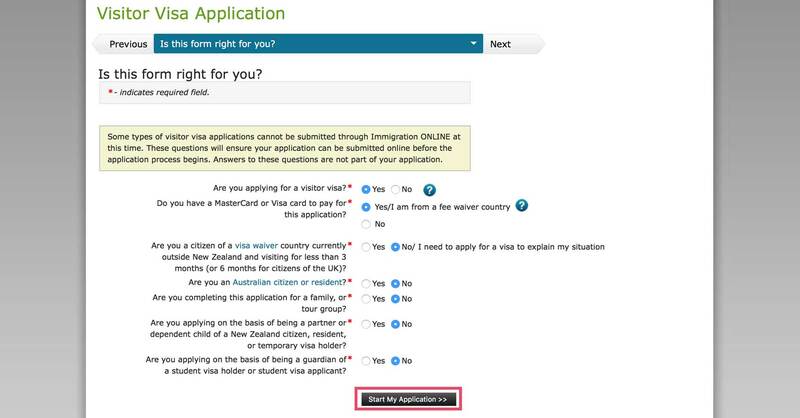 Under ‘Applications‘, click ‘Create a new visitor visa application’. A page titled as ‘Is this form right for you?‘ will show up next. I answered with the following. Take note that under ‘Do you have a MasterCard or Visa card to pay for your application?‘ I selected ‘Yes/I am from a fee waiver country‘ — this is because as Philippine citizens, as long as your tourist/visit will only be less than 59 days, we do NOT need to pay for a visa fee (hurray!). Once done, just click ‘Start my Application‘. Complete all answers to all questions in English. You do not need to complete all of the application form at once. You can save your application form at any time and come back later to finish it. The sections may be completed in any order after you have completed the first two sections. You can move between sections by clicking ‘Continue‘ or by clicking another section title (when you move to a different section, the application form is saved). After 30 minutes of inactivity, you will be logged out. Any unsaved information will be lost. Somewhere in the end, you will need to upload documents to support your application — I will discuss more about this in Step #3 below. 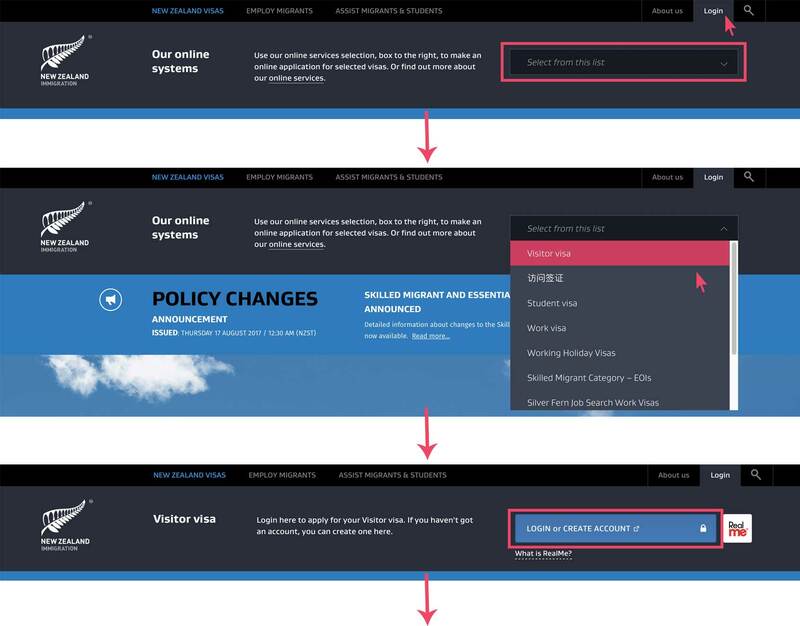 Like I mentioned previously, while you’re filling in your New Zealand visa application online, the site will ask you in the end to upload relevant supporting documents as based from the answers you provided. Below is a list of the documents I uploaded, which you can upload too. Those marked with an asterisk (***) are the basic requirements. NOTE: You can only use .JPG file type for your photo, and the rest should be in .PDF under 10MB size. If you’re not familiar with .PDF files, I have a section below with tips and explanations on how to do such — it’s very easy! Otherwise, these can be done quickly by any computer or internet cafe shop. ***Passport Biodata Page – this is a copy of your passport’s first page which contains your passport data and personal information. ***Financial Documents – uploaded under the section that asks for ‘sufficient funds‘, you can include in one .PDF the scanned copies of any of the following as applicable or available to you: bank certificate, travellers’ cheques, bank statements for the past 6 months, payslips for the past 3 months, and credit card statements and limits. If you have a sponsor, it’s helpful to also include a signed letter from your sponsor (this could be your employer or any other third party such as a family, a friend, a relative etc.) that indicates how they will be sponsoring your trip. It also doesn’t hurt to show your own financial documents together with your sponsor’s financial documents. If you have a sponsor that is a family, friend, or relative, you must also submit Proof of Relationship with said sponsor. These can be photos, chat conversations, birth certificates, etc. ***Confirmed Return Travel Tickets – unlike other Embassies, the New Zealand Embassy’s requirement for airline tickets is different: if the rest only asks for airline reservations, New Zealand rather asks for confirmed tickets. This is indeed rather risky, but unfortunately, it’s their requirement — so, all the more reason why you have ensure that you provide enough documents and proof to make your application a success (which is rather easy with the NZ Embassy)! UPDATE: Due to recent changes, there have been conflicting info about this online. The NZ website says that reserved tickets are fine whereas the Embassy itself in the Philippines says that they need confirmed tickets. There have even been instances wherein applicants were approved even with just reserved tickets; whereas there are others who were asked for confirmed/booked tickets. That being said, it’s up to you to submit reserved airline flight tickets only — besides, I surmise that the Embassy will email you either way if they wanted confirmed ones from you. ALTERNATIVES FOR CONFIRMED TICKETS: You can submit open-dated flight tickets, or a written confirmation from an airline or travel agency stating that your onward travel has been booked and paid for. You can upload this under ‘Evidence‘ on ‘Evidence that you’re a bona fide applicant‘. This is basically the section that asks for proof that you will return to the Philippines after your trip. You can upload this under ‘Letter from your employer‘ on ‘Evidence that you’re a bona fide applicant‘. This is basically the section that asks for proof that you will return to the Philippines after your trip. Hotel Booking. These are confirmed hotel bookings for the entire duration of your stay in New Zealand containing the name and contact details of the hotel(s). I usually book my hotel stays via Booking.com and/or Agoda.com. With them, you can book a hotel with NO pre-payment and you can even cancel the booking a day before your arrival with NO cancellation charges at all. So yes, you can make reservations without any payment, you can change the reservation anytime, and you can cancel them at no cost as well if in case your visa is not approved. You will see later on that some sections on the upload page are not enough if you want to provide more related supporting documents or evidences. If this happens, it’s not a problem to collect related documents in one (1) .PDF for upload on a certain section. That being said, just remember to keep related files together and to NOT split them. Meaning that for example, if you have a lot of pages for your bank statements, keep them together in one .PDF file. If you want to include your bank certificate, then you can include it in the same .PDF as the bank statements since they’re related — but put the certificate only after all your bank statement copies. Now, if you’re not familiar on how to make .PDF files, read on below. How to do .PDF files? ◘◘ How can I make .PDF files? ◘◘ How can I merge multiple documents into one .pdf? You can paste scanned copies of documents or images in a Word document and then under ‘Save as…’ click on PDF. ◘◘ My .PDF size is too large! How can I keep it below 10MB? Once you finish and submit your New Zealand visa application online, a final ‘Thank You‘ page will show. Print this page. It will tell you to submit it together with your passport to VFS. Wait for an email from an immigration officer. It will basically be a letter saying that they completed their ‘1st’ assessment of your application, and then it will list the items that you need to submit. When I got this email, it only listed my passport as the item that they needed me to submit to VFS — meaning that they didn’t want any other supporting documents from me. This email arrived a day after I submitted my application online. The way I see it, you can just go to VFS immediately to submit your passport without waiting for the email. But if you are busy and want to save time, you can just wait for this email so that IF in case the Embassy wants other documents from you, you won’t have to come back several times to VFS. Submit via a Representative. Just provide an authorization letter with copies of your ID and the representative. TIP: Don’t bring any electronic device, power bank, or cords because for some reason, the guard will not allow it inside the office. (There is a locker room nearby that you can deposit these things into and it costs Php 75.00). Rest assured, your phone is the only electronic device that they allow inside. As for payments, as I’ve mentioned before, there is NO visa fee to be paid to the embassy if you’re staying 59 days or less. (If you are planning to stay for more than 59 days, the visa fee is at NZD$165 or about Php 6,000~). In VFS, you or your representative can pay in cash, credit card or bank transfer. If you’re planning to submit by post, you can send your payment by bank transfer. To know how to do the bank transfer, see here. Once everything is submitted and paid for, remember to keep the payment receipt. Later on, you will also receive an acknowledgement email from Immigration New Zealand that they have received your application. ***UPDATE AS OF JANUARY 2018: It seems that starting this year, the New Zealand Embassy will start granting electronic visas (or eVisa) if you apply online. This means that you should not be surprised if you will not have a physical visa label in your passport. Just print your visa approval letter which will include your visa details, keep it in a safe place, and carry it with you when you travel to New Zealand. Customarily, the processing time for online applications of New Zealand visas is within 20 days — this, of course, entirely depends if all of your documents are complete, or if Immigration NZ will need more from you. It’s said that if you have or had visas issued by first-world countries, you can receive your results in just 3-5 working days. Me? I got mine in just 2 working days and it’s mostly because mine was a special case (I was going on a press trip to New Zealand with their tourism board and Singapore Airlines; I was pressed for time and Singapore Airlines thankfully sent a request to expedite my application). NOTE: You can apply for a faster or streamlined visitor visa processing IF you are a Singapore Airlines PPS Club, KrisFlyer Elite Gold or Elite Silver member — and a citizen of one of the following countries: China, India, Indonesia, Philippines, Thailand, or Vietnam. When applying online, there will be a section there that asks for info regarding this. If applying by paper, you will have to provide a copy of your PPS Club, KrisFlyer Elite Gold or Elite Silver membership card showing that it is current. Take note that you can only retrieve your passport from 2:00PM to 4:00PM from Mondays to Fridays in VFS Manila (or 1:00PM to 4:00PM in VFS Cebu). Where to Stay in New Zealand? Come and check out my list of the ‘Best Hotels in Auckland‘, ‘Best Hotels in Wellington‘, ‘Best Hotels in Queenstown‘ and ‘Best Hotels in Christchurch‘ which features the top recommended choices for cheap to luxurious accommodation choices. ◘◘ How early can I apply for my New Zealand visa? There is no concrete answer to this on any page of the Immigration NZ’s website. I asked their ‘middle man’, VFS and they told me that the embassy does not have any requirement for the number of days before anyone can apply. So a person can apply any time and once granted, the validity of the visa will be based on the intended date of travel. From what I saw on Immigration NZ’s website, you must at least have NZD$1,000 per month (for 1 pax, that’s around Php 36,000~ or USD$710~) or at least NZD$400 per month (or around Php 14,700~ or USD$280~) if you’ve already paid for your accommodation. If it can support your application even further, then sure! The Embassy encourages that, especially if it can help provide more proof or evidence to your situation. ◘◘ How long does it take to get the results of my New Zealand visa application? Like I’ve mentioned above, it can take 3-5 working days, or up to 20 days (and more, if in case the Embassy wants more documents from you). I got mine in just 2 working days for being a Singapore Airlines Elite Silver member. (See ‘Step 5’ section above for more details). I didn’t do any interviews. VFS was only there to collect and check your documents. However, it is possible that the Embassy of New Zealand will call or request you to visit them for an interview after they receive your documents — but I’ve never heard of such a case when applying for a tourist visa only. You can check here to track the progress of your New Zealand visa application. As you can see, applying for a New Zealand visa is easy, and I hope that with this visa guide, I can help you prepare your documents and requirements better so that it will all become a success. If you’ve already applied for a New Zealand visa before, how was your experience? Address line 1 can only contain characters a-z, numbers 0-9, spaces or #&' -/_`. Have you ever encountered this? I even tried to put the whole address to words but the problem persists. Hey Ed! Did you erase the commas? Sometimes it works. Let me know! Hi! I did same as what the customer service instructed but still did not work. Then I tried to put into words also the street number even it was long and it worked! I'm not sure but maybe the error message was strict in checking that the address should only contain letters, numbers, spaces OR symbols. not and/or. Maybe it's a bug. Hi Aileen! You are such a big help. My E- visa was approved within 15 calendar days. Million thanks! Yay, that's awesome! Enjoy your trip! Hi Jewel, may i ask did you provide a 2316 BIR form? is it necessary? Hi Jewel. Did you submit your application online or by going to the VFS office? Update: We got our visa approval yesterday. :) We are just waiting for the notification as to when our passports are going to be delivered. Hi! Thanks for this article. It's very helpful. Quick question. If you are being asked for your passport, does that mean your application has been approved? Thanks! Hey May, not really. They just need passports to be submitted for every application. :) Good luck! hi Aileen I recently apply nz visa then they accept my application so I send my passport and others document. and now I've got back my passport but there's no label on it no email also ist that alright? thanks. For tourist visa, nope :) Pls see list of requirements above. Yes, the e-visa is already available, I already had it before. They still need your passport even if they issue e-visas now. :) Good luck. Thank you so much Aileen for the tips. They are most helpful. My husband and i plan to go there next year. What us the best season to go there if I may ask? Is it better to go there from melbourne ir from manila. We are visiting melbourne for a month by march or april. You're welcome! As for the best month to come, any season is actually perfect. It depends on your preference. Take note that December to February is summer so it's the busiest (with January being the hottest). 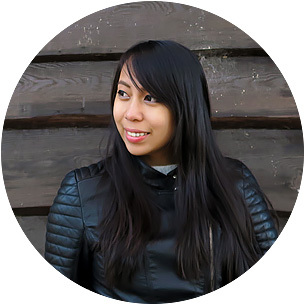 Hi Aileen! Is there any chance to receive (e-)Visa approval even without me submitting my passport to VFS Global? As of this moment, VFS still needs your passport when applying for the eVisa.